If you’re looking for effective ways on how to measure temperature in a room, then this guide will be of help to you. The temperature of a room is something that is important, but is never really given much thought. Of course, when it becomes too hot or too cold, you will want to change the temperature more to your liking, but aside from that, there really isn’t much of a reason why you should care about the temperature of the room, right? In reality, the temperature of a room can play a role in many, many things. First of all, temperature plays a role in comfort. Nobody really wants to be in a room that is far too hot or cold. In fact, being in a room that is an uncomfortable temperature can often result in you being in an irritable mood, and this is something that nobody really wants to happen. Depending on just how hot or cold a room can get, it can actually affect your health. Being in a room that is too hot can end up being dehydrating, as you will expel most of the water in your body through sweating. Likewise, being in a room that is too cold can end up making you uncomfortable, as your fingers and toes become numb. To make sure that your room stays as comfortable as possible, you will want to monitor the temperature of the room. There are several ways that you can go about doing this. The temperature of a room is quite important in a number of areas. As stated above, it’s important for comfort and health, but more specifically, it can help the condition of your house. A house that is too cold runs the risk of having wet walls, which can bring mold. Mold can easily cause damage to the property, as well as your health, making it something that you will want to avoid at all costs. At the same time, a room that is too hot can lead to you becoming dehydrated through the sweat you lose. A room that is too hot can also be harder to concentrate in, and in addition to this, it has a large impact on the environment, as well as your finances. There are also different temperatures that are ideal for different rooms. The living room and the study should be no more than 68 degrees Fahrenheit and no more than 71. Nurseries and bathrooms should be between 71 and 75 degrees Fahrenheit. However, the kitchen should be closer to the 64-68 range. The bedroom should be slightly cooler than that, being closer to the 60-66 range. If that isn’t cold enough, hallways and storage rooms should generally be around 59 and 64 degrees. Sadly, this can change depending on your relation to the equator. These are all things to consider when you are planning to measure and alter the temperature of a room. With that being said, there are many ways that you can measure temperature. Sometimes, you do not have to get an accurate sense of what the temperature of a room is. If it is uncomfortable in the room you are in, it is time for you to either turn on the heat or open a window. The easiest way to check the temperature of a room is to stand inside the room and see if you are too hot or too cold. To get an accurate sense of this, you will want to make sure that you aren’t wearing a heavy jacket or almost nothing, as this can alter your sense of the room’s temperature. If you find yourself sweating more than usual, being more irritable than usual, and just generally feeling too hot, these are some signs that the room you are in is too hot. When you notice this, it is time to turn on the air conditioning and cool the house down. Likewise, if you find yourself shivering, teeth chattering, and unable to feel your fingers, these are some signs that the room you are in is too cold. When you notice this, you will want to start turning up the heat and putting a few extra layers on. While this method of measuring the temperature isn’t necessarily the most accurate method, it is one of the most simplistic methods and it will not involve you doing anything more than simply walking into the room. However, there might come a situation where you need to get a more accurate reading of the room’s temperature. There are still several methods you can use to figure this out. One of the most traditional methods of measuring the temperature of a room is using a thermometer. There are several different kinds of thermometers that you can choose from. Some thermometers are digital and will have various measurements that include temperature, time, and even the humidity of a room. This is wonderful when you want to get an accurate reading of several different factors without having to set up three different things around the room. Because these thermometers have more features, they are generally a bit more expensive than a typical thermometer. If you want to spend a minimal amount of money on finding a way to measure the temperature of your room, then your best bet is to go with a very basic, even analog thermometer. These thermometers, as you might be able to imagine, have no digital interface for you to marvel at. However, because they are relatively simplistic, they tend to be significantly less expensive than their digital counterparts. Both of these thermometers serve the same purpose, and it is completely up to your priorities when it comes to choosing between an analog or digital thermometer. Some situations require you to find the temperature of a very specific area of the house, and a traditional thermometer might not be the best option for this. If you need to get the reading of a very specific spot, then you might want to consider a laser thermometer. These thermometers use lasers to take the temperature of a pinpoint location. Usually, these are bit more expensive than intricate digital thermometers, but they also have a much larger range. For instance, there are some thermometers that range from well below -50 degrees Fahrenheit all the way up to over 1,000 degrees Fahrenheit. No matter how small an area you need to measure the temperature of, with a laser thermometer, you will have the reading you need in no time. 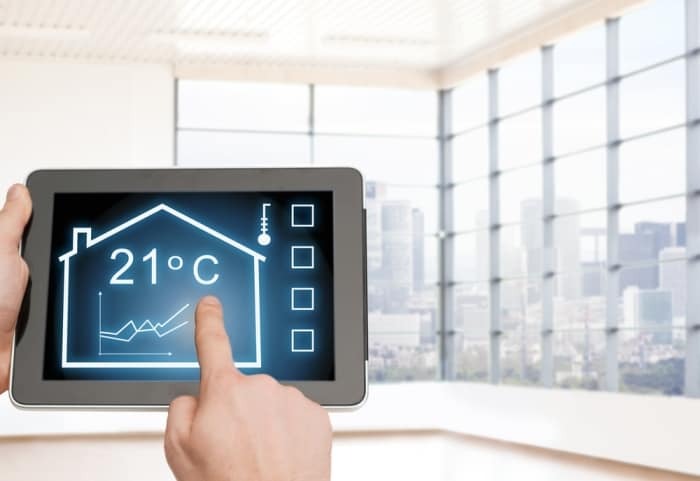 Some people would rather be able to use the devices that they have in their own house to measure the temperature of a room, which can sometimes rule out going to the store and buying a thermometer. In this case, you might want to consider getting an app for your phone that can measure temperature. Usually, these apps will utilize the built-in temperature sensor that most phones have. These thermometers can either be free or paid for. More often than not, the free ones will have advertisements and have the potential to not be as good in terms of quality as an app that you would need to pay for. On the other hand, paying for an app doesn’t guarantee quality. If this is the route you want to go down, then you will want to pay extra attention to the reviews on these apps. You should note whether or not the reviews seem to be filled with people who were paid to leave a good review, or if the reviews are filled with people who have a genuine opinion about the app. There is an extra air of caution when it comes to using these apps, but at the same time, it means that you don’t have to inconvenience yourself with going to the store and trying to find a thermometer that suits your house. These are some of the ways that you can measure the temperature in a room, with each method having its own advantages and disadvantages. There really is no “best” method, as different people may agree or disagree on the best way to handle things. Some people might enjoy the simplicity of just checking whether or not a room is comfortable. However, this method is nearly useless to people who need to get an accurate reading of a room’s temperature. Finding a proper thermometer can take time, especially if you and other people in your house disagree on the best methods. There are digital thermometers that can measure various things, but at an increased price. At a lower price, you could get an analog thermometer, although if you need to measure the humidity of a room, you’re out of luck with that. If you need to measure the temperature of a specific area of the room, a laser thermometer is your best bet. With that being said, it is both more expensive and it doesn’t give a very general reading of the entire room, making it quite unhelpful for measuring the temperature of the whole room. Getting an app is almost as simple as measuring the temperature based on your own judgement, with the included freedom to choose an app that is free or one that you pay a small sum of money for, although there is more caution when it comes to choosing a safe and reliable app. Depending on your needs, there might be one method of measuring the temperature of a room that is better than another. Regardless, there are several ways that you can eventually get the temperature of your room.